Visits to my family’s home in MS always involve food adventures. Last week, one of them came in the form of a mere description of a sandwich by my good friend since childhood, Margaret Deavours, who had heard about it on, of all places, NPR. This sandwich has become her go-to and I now see why! 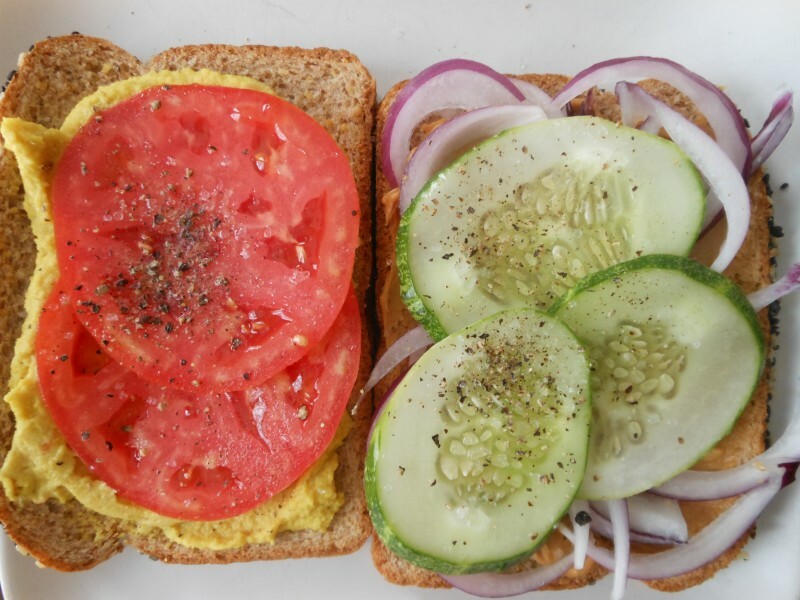 Called *Diane’s Dad’s Sandwich, it consists, in part, of summer garden favorites: thinly sliced vidalia or red onion, cucumbers, and tomatoes. These fresh ingredients are “sandwiched” between a top layer of (vegan) cheese ( white cheddar is used in the original recipe) and, believe it or not, a bottom layer of crunchy peanut butter. 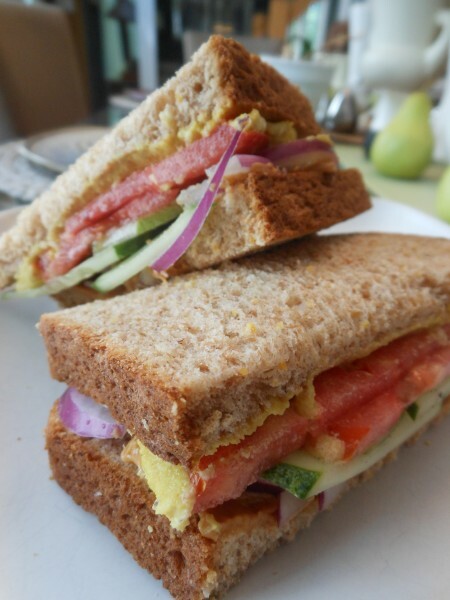 Stacked high between 2 slices of whole grain bread–untoasted for ease of eating–this sandwich is a winner in more ways than one!! *Be sure to read all about the sandwich by following the link. 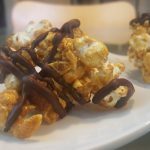 Recipes entered into the contest had to be accompanied by a story; it is NPR after all! Margaret made the sandwich sound so intriguing that I created a special Vegan Sharp Cheddar Cheese just so I could partake because, apparently, the magic of this sandwich is attributed not only to it’s fresh and unusual combination of ingredients–unusual, at least, for a sandwich–but the precise order in which each and every one of them hits one’s palate. That being the case, be sure not to flip the sandwich as you lift it from plate to face! Margaret’s only addition is, to me, essential because I tried it with and without: fresh basil or cilantro in keeping with the Thai flavor profile (not pictured below, as I added it later and LOVED it). To stay even more true to that profile, I chose Thai basil with it’s hint of anise, and will never make it any other way–wowza! Because fresh herbs are an add-on, I wasn’t sure where to place them in the all-important stacking order, but I chose the middle, between the cucumber and tomato. Other than swapping out the cheese for my delicious vegan version and adding a sprinkling of sea salt and freshly ground black pepper, the only other change I made to the directions was to soak the red onion in unsweetened soymilk for a few hours to temper some of that peppery bite and strong aroma. Don’t be put off by the peanut butter! Besides the synergistic effect of all the ingredients, it is probably the peanut butter that makes this simple sandwich so extra-special! Spread 1 piece of bread with peanut butter and then layer on ingredients in the order given. A note to you sandwich flippers: be sure to eat the sandwich with the peanut butter on the bottom! Place all ingredients in bowl of food processor and process several minutes or until smooth, scraping down sides of bowl as necessary. Store leftovers covered in refrigerator. This soup is as delicious as it is nutritious and lovely. Thicker than most Thai restaurant soups (due to the starch in the squash), it is very filling, yet still light. It was inspired by my love of all things Thai, but also by an over-zealous trip to the farmer’s market this week considering I am leaving town on Sunday. In a little bit of a panic about not wasting food, I created this soup brimming over with vegetables like red bell pepper, fresh chili pepper, pattypan squash, grape tomatoes and Swiss Chard. I had purchased 2 bunches of the chard–what was I thinking–so I created a really tasty Swissh Chard and Pumpkin Seed Pesto out of the remainder, which will freeze nicely. I used the vegetables I had on hand, but feel free to substitute other veggies, keeping flavor, texture and color contrast in mind. In addition to the onion and bell pepper, you will want about 4 cups of vegetables. Precokl firmer vegetables like squash and carrots, and simply heat softer ones like tomatoes and mushrooms. In a large (4-quart) saucepan, heat olive oil over medium-high. Add onion, bell pepper, ginger, garlic, chili pepper, and a pinch of sea salt, and freshly ground black pepper, and sauté, stirring frequently, until softened, about 5 minutes. Add coconut milk, water, bouillon cube, and soy sauce, and heat until barely simmering. Add squash, tomatoes, and Swiss chard, and return to a gently simmer. Avoid boiling. Stir in cilantro, lime zest, and basil leaves and heat through. Serve in large bowls with 1 teaspoon of vegan fish sauce or rice wine vinegar stirred into each. Garnish with chopped nuts and a sprig of basil or cilantro. This recipe is a two-fer: my delicious Cilantro-Mint-Chili Pesto is tasty enough to eat with a spoon, never mind the potato salad! Use this versatile pesto, which can be nudged in a more Indian or Thai direction, in noodle dishes, rice dishes, soups, sandwiches, appetizers like crostini, and more. 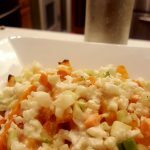 Make it first so that you have it on hand to quickly stir into my potato salad whose topping puts it right over the top! I pulse together carrots and cashews in a food processor, seasoning them only with a pinch of black salt for that inimitable, slightly sulfur-y “boiled egg” flavor, so perfect for potato salad. Place cilantro, mint, chile, and coconut in a food process and pulse to finely chop (this took about 30-35 pulses in my processor). Add lime juice and 2 tablespoons of sugar or agave nectar, and pulse to fully incorporate. Taste and add another tablespoon of sugar or agave nectar, if desired. With motor running, stream in olive oil. Season with a pinch of salt. Adjust seasoning if desired and store in refrigerator in an airtight container. Simmer potatoes in salted boiling water over medium-high heat, loosely covered, until tender, approximately 10 minutes. Rinse under cold water and drain. In a medium bowl, whisk together mayonnaise, pesto, and a pinch of salt and pepper. Add potatoes and fold together with mayo-pesto mixture until well-combined. Taste and correct seasoning as desired. In a food processor, pulse together carrots, cashews, and black salt until finely chopped (not mashed). Taste and adjust seasoning if necessary. 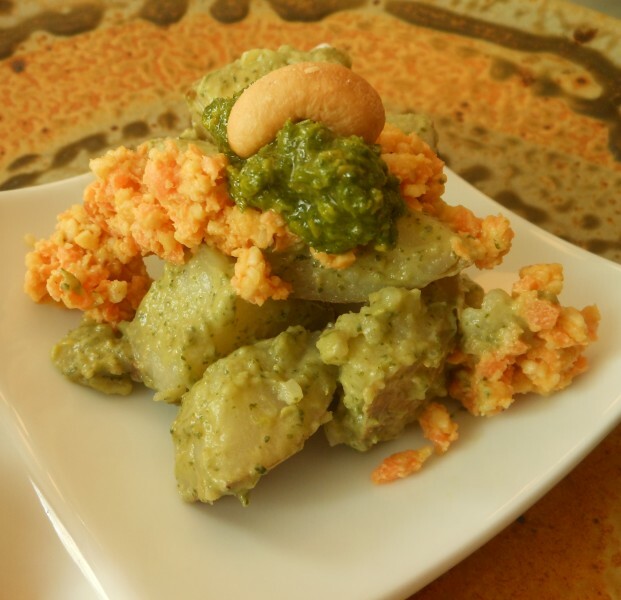 Serve potato salad topped with Carrot-Curry mixture and garnish each serving with a dollop of the pesto and a cashew. I am THRILLED to be one of a dozen invited contributors to participate in “Let’s Eat,” a new initiative of Eastern Virginia’s public TV and radio station, WHRO! I had no more created this recipe than I received the invitation. 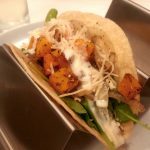 Since it is sponsored by Whole Foods, VA Beach, and our local chapter of Buy Fresh, Buy Local, a recipe that featured local produce seemed in order. At the time I submitted it, pattypan squash was in season, but the site was just launched and, alas, pattypan squash is no longer in season, at least not in Coastal Virginia. 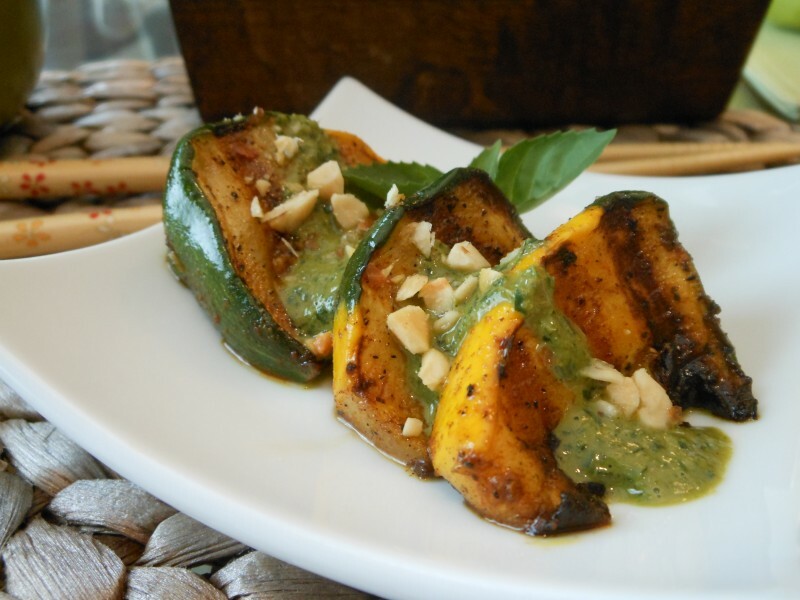 But the pesto would be luscious on grilled pumpkin, sweet potatoes, and much more. And my basil is still in full bloom! Stay tuned for more tasty treats ready for their close-up. I will be posting regularly on “Let’s Eat” and will direct you from here to there! 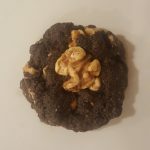 Like our dreams, sometimes the origins of cravings can be traced right to their source, and other times, they seem to have emerged out of nowhere. The latter is the case with these Vegan Thai Sloppy Joes. I whipped into the grocery store on the way home for lite coconut milk and nuts, but everything else was at the ready in our pantry and fridge, following last week’s trip to the farm stand and Trader Joe’s, speaking of Joes. Sloppy Joes would not be considered a balanced meal by anyone’s standards, even when built around tempeh. And I wanted this to be a one dish wonder. So a quick mental review of veggies found in Thai dishes resulted in the addition of finely chopped carrot and farm stand-fresh kale (in place of the more typical spinach). The color, taste and texture that these ingredients added, not to mention the moisture, was exactly right. You can certainly serve this addicting mixture on toasted buns, but trying to keep the finished dish more true to it’s Asian inspiration, I like it best served over lightly toasted rice cakes. Heat oil in a large cast iron skillet over medium-high. Add carrot and a pinch of salt and saute, stirring frequently, for about 2 minutes. Add the onion, another pinch of salt, and saute another 2 minutes. Then add the kale and the garlic, another pinch of salt and the water, and saute for an additional 2 minutes. Add the tempeh and saute 2 minutes more. Add curry paste, tomato paste, soy sauce, sugar, coconut milk and fish sauce, and saute, still stirring frequently, for a final 10 minutes or until mixture thickens, slightly reduces, and all flavors combine. 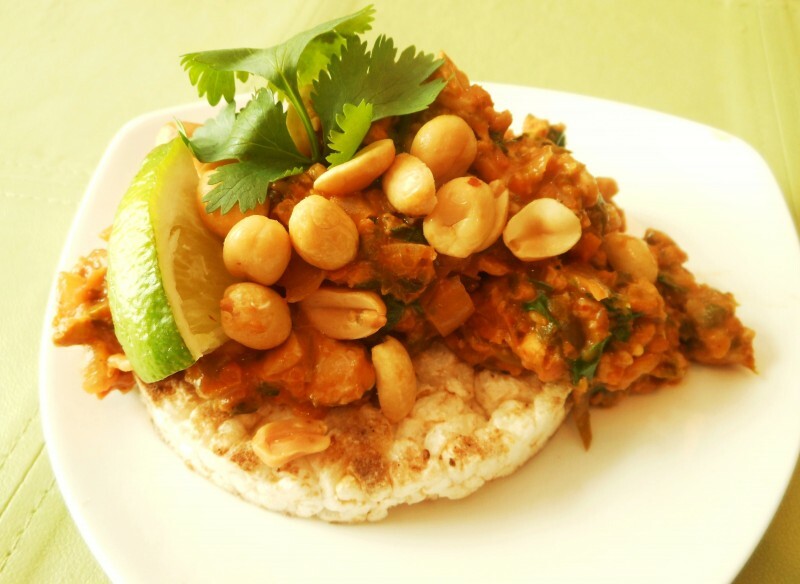 Stir in lime zest and chopped cilantro, and serve immediately over toasted rice cakes garnished as desired. 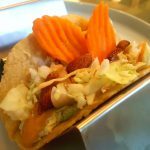 Find this unique and uniquely delicious recipe inspired by my Thai Not Dogs and Mexican street food on One Green Planet! 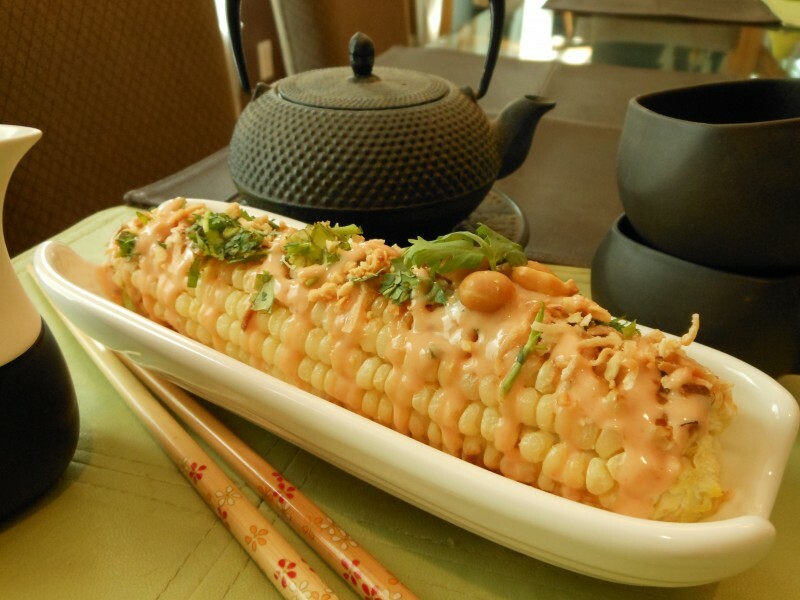 Quick before the beautiful summer corn is a fading memory! Dear “dog”! This is surely the best “dog” I’ve ever eaten, much less made, and it ranks right up there with some of my favorite meals. 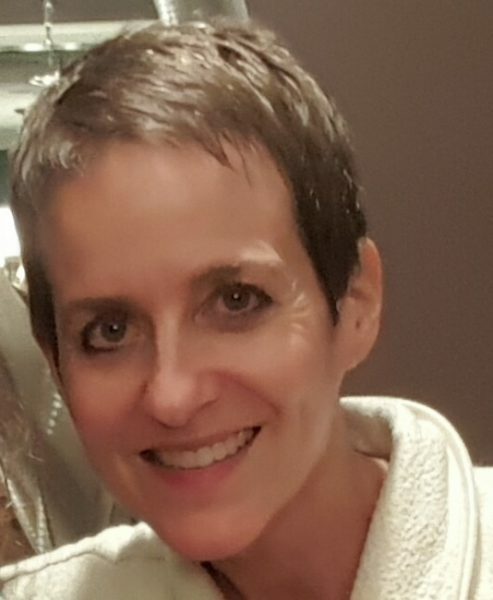 Last night, my dear, dear friend, Sharon Clohessy, aka Ms. C–the art specialist for our district–and I went on a beach picnic for two. She lives at the oceanfront, so we loaded up, walked across Atlantic Avenue (think Monopoly board) up a little path shaded by a canopy of trees, and we were at the wide sandy beach. We love being able to do such “frivolous” things mid-week when school is not in session. But we enjoyed ourselves so much that we plan to continue right into the fall. Time spent with Sharon is always magical, and we happened to be at ocean’s edge during the “magic hour” when everything takes on a silvery, barely pinkish hue. I haven’t been so relaxed, yet stimulated by our conversation, in a long time. 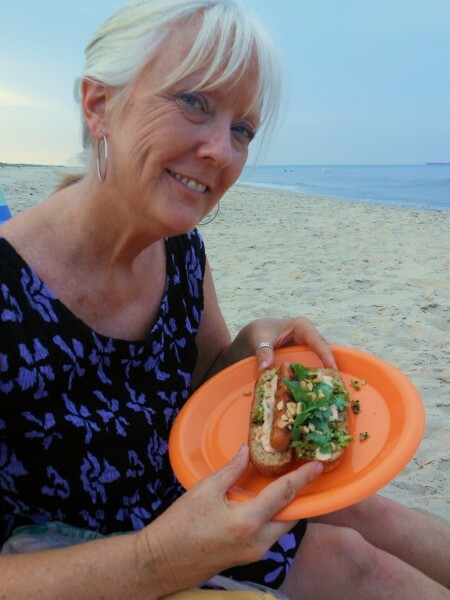 For our meal, I was inspired by a food feature in a recent magazine–maybe Southern Living?–about non-traditional hot dogs. One was Thai and I have been fantasizing about it ever since. However, I didn’t use their recipe, which wasn’t vegan anyway, preferring instead to create my own. 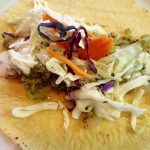 I decided on a kale and cabbage slaw (even though kale isn’t in season here)–because a day without kale is like a day without sunshine–and a Chili-Lime Mayo, though that name doesn’t do it justice, as I also whisked in creamy natural peanut butter and coconut cream. OMG! It is out of this world, good enough to eat unaccompanied, as you can see in the photo below. 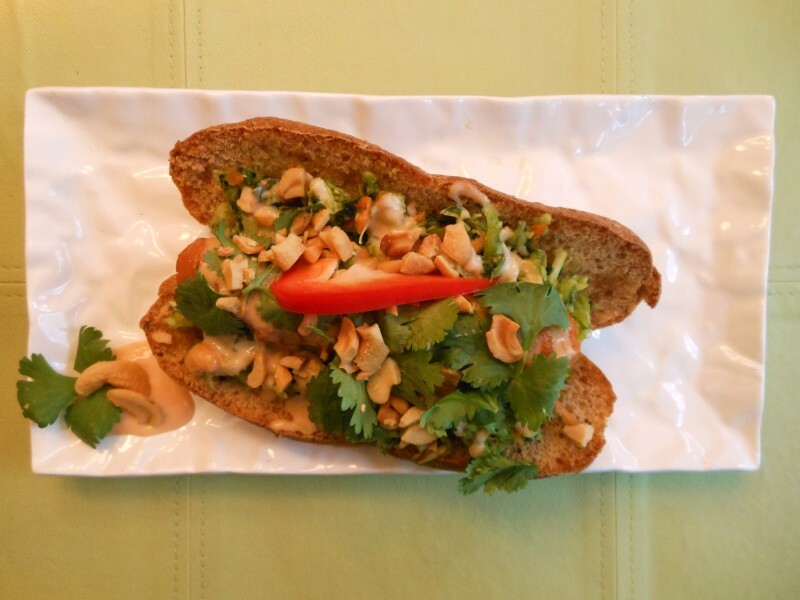 We topped our dogs with fresh cilantro leaves and chopped cashews. Truly, this is a stunning rendition of a lowly “dawg.” I ate leftovers for lunch AND dinner today! Sharon contributed marinated cucumbers, a delicious Cupcake Sauvignon Blanc, and, for dessert, simple pitted cherries and sliced white peaches. So perfectly simple and elegant. Even if the beach is far away from wherever you call home, I hope you will “relish” this special dog. Place about 1/4 of the slaw on each toasted bun. Top with a grilled “not” dog. Add a generous squiggle of the Chili-Lime Mayo, and top with 1/4 each of the cilantro leaves and chopped cashews. Serve immediately. If I’ve learned anything about cooking, it is that people’s palates vary dramatically. 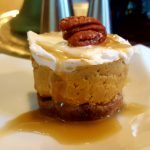 So, while this balance of flavors tasted perfect to me and my friend, you may want to adjust the sweet-tangy balance, and you should feel free to do exactly that! Fluffying with a fork is a key step. You may shred the veggies by hand, but I use the grater attachment of my food processor. If using a food processor, pack the kale into the tube, turn the machine on, and use the plunger to press the kale firmly and steadly onto the blade. Repeat with cabbage, tightly rolling two leaves at a time and feeding them into the tube in the same manner. Repeat with carrots. Scrape veggies into a medium bowl before repeating with bell pepper, as it may create significant moisture that needs to be drained/blotted. Add the pepper to the bowl of veggies along with remaining ingredients and toss the mixture with a fork to combine. Cover and refrigerate until serving time. 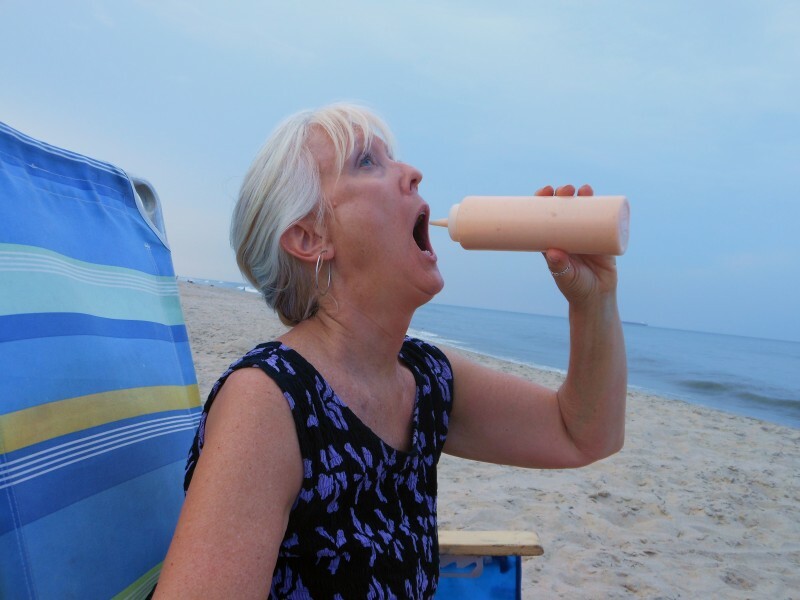 As with the slaw, this balance of flavors tasted delicious to me and my dining companion, Sharon–as you can see, she’s “drinking” it out of the bottle!–but feel free to adjust to suit your taste. Whisk all ingredients together until smooth in a small bowl. Spoon into a “squirt” bottle if desired to allow you to add it to your “dogs” in a pretty squiggle. Refrigerate until serving time. My Thanksgiving Day post is coming up, but–and I bet it is no different in your household–there is no time for carefully staging food photographs in the midst of the convivial holiday hubbub. So, before the throngs gather today–and, in any event, with less going on in the kitchen–I hope to photograph the components of our meal. 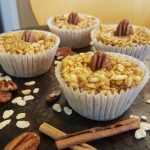 I made one recent recipe and two brand new ones that received rave reviews, so I’m looking forward to sharing them with you. 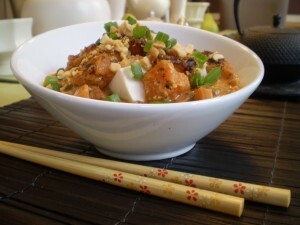 In the meantime, though, I am excited to offer this Thai-inspired pumpkin dish. If you follow The Platter, you know that I am all about fresh pumpkin this year, including in Asian preparations, like this one and my Vegan Miso-Roasted Pumpkin and Grilled Tofu over Udon Noodles which was featured on OneGreenPlanet.org. 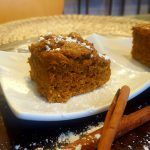 Pumpkin is so agreeable to rubs, and this peanut butter riff is no exception. 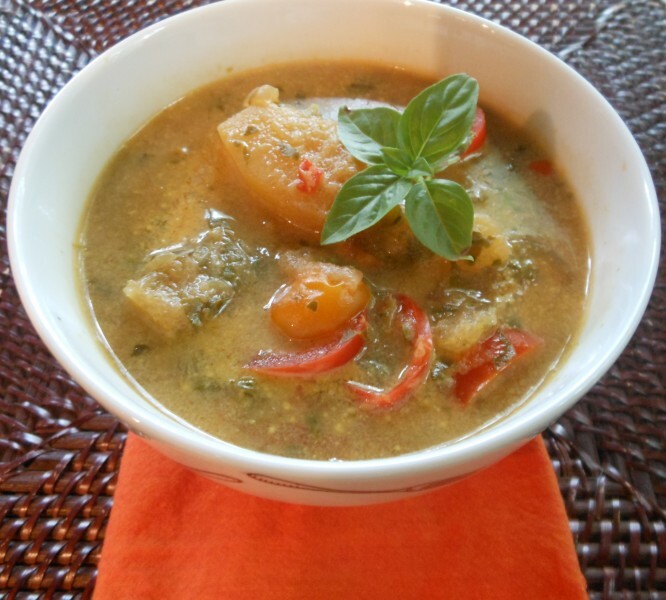 Enjoy it with creamy white chunks of tofu over my silky, golden, and pleasantly spicy melange of red bell peppers, onions and chard in a coconut-red curry sauce thickened with pureed pumpkin. Its subtle tang is courtesy of fresh lime juice and vegan fish sauce. Preheat the oven to 450 degrees. Oil a large metal baking dish and set aside. In a medium bowl, whisk together peanut butter, vegan fish sauce, and curry paste until smooth. Add pumpkin and toss gently to coat. Transfer to the prepared baking pan, spread out, place in the oven and roast for about 8 minutes. Stir gently or flip chunks, and roast an additional 8 minutes or until lightly caramelized. While pumpkin roasts, make sauce. When pumpkin is finished cooking, remove the pan from the oven. If sauce isn’t quite finished, cover pumpkin to keep warm. In a large cast iron skillet or wok, heat olive oil over medium-high. Add onion and a pinch of sea salt and saute, stirring, for about 3 minutes or until onion begins to soften. Add bell peppers and continue sauteing for about 2-3 more minutes or until it begins to soften. Add garlic and chard and saute for one to two minutes or until chard is tender, but still bright green. Add curry paste and saute, stirring, just until smooth and incorporated. Add coconut milk and pumpkin puree, and cook until heated through. Add fish sauce and lime juice, and stir to combine. Check for seasoning, and add salt if necessary. Stir in optional Thai basil and cilantro and remove from heat. Serve sauce over cooked Jasmine rice topped with roasted pumpkin and tofu. Garnish with chopped peanuts and sliced green onion. 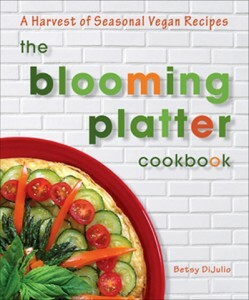 For 150+ more specialties of the season, I hope you will check out The Blooming Platter Cookbook. Somehow, our third annual Happy Birthday, Julia Child’s potluck dinner party came and went in August without my ever having posted any of the recipes. It’s a little tricky to shoot nice images because, by the time the guests arrive with their beautiful food–made according to or adapted from Julia’s recipes or just very French–the light isn’t very cooperative. But, I remembered to stage this photograph with the small amount of leftovers we had of this scrumptious dish. I just never remembered to post it. 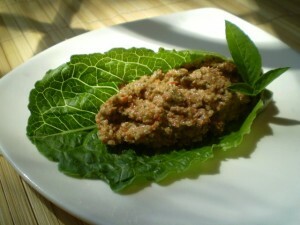 Called Thai Lettuce Wraps by their creator, Diane Stobo, we changed the name to “French Vietnamese” to fit our theme. Made by Amelia, aka “Little Chef,” the young niece of two of our guests, the dish was a hit with everyone. She is absolutely adorable and wanted to contribute something to the dinner, meet me–and our dogs–and have me sign a couple of copies of The Blooming Platter Cookbook. I was truly touched. Amelia and her aunt recommend a few more walnuts in the filling. And, to veganize the sauce, simply substitute agave nectar for the honey. Also, since it’s now fall, use whatever tender lettuce leaves you can find in season. For 150 original mouthwatering seasonal recipes, I invite you to check out my new cookbook, The Blooming Platter: A Harvest of Seasonal Vegan Recipes. 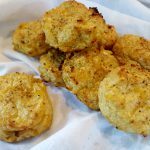 Vegan Cauliflower Biscuits no pre cooking of cauliflower!